Thanks to Canonical and Linaro I received a Pandaboard some time ago. Finally I succeeded in building KDE on this device (I have never seen crashing compilers before). And I am proud to announce that kwin_gles (master) runs out of the box without any adjustments on this board. 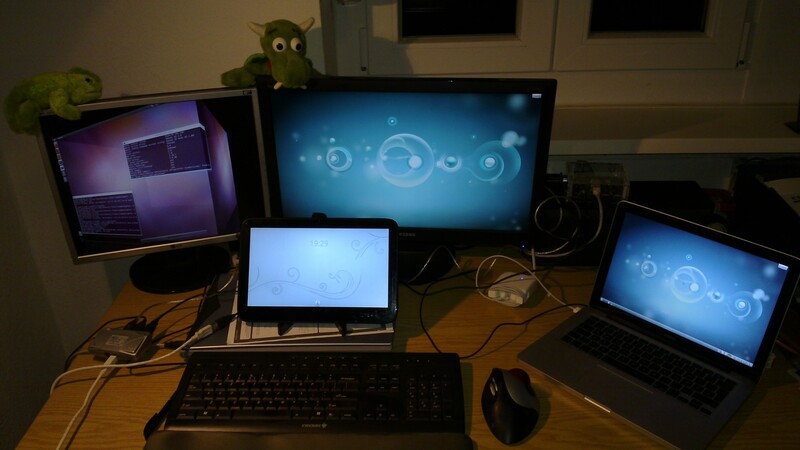 As today is also KDE’s birthday I present the KDE Crew: All my devices running KWin on one photo (the next to be konquered device was involved by doing the photo). We see KDE is prepared for the devices coming in the next 15 years. HAPPY BIRTHDAY! “the pandaboard between the right screen and the laptop” – Well, at least I have no apples at home, but the little white box looks like a PSU. What is the tablet in the middle above the keyboard? If this is the PB having a display, then why another one connected to it? Or is the PB the silver case under the tablet? but the little white box looks like a PSU. What is the tablet in the middle above the keyboard? If this is the PB having a display, then why another one connected to it? Or is the PB the silver case under the tablet? the white box is just the MagSafe for this fruit thingy. The tablet is an ExoPC Slate, the silver case is a scanner and the pandaboard is in the right of the screens. This breaks otherwise sound behaviour in Compiz. I.E. if I’m on my first desktop, I click an Empathy/Kopete icon to switch to my second desktop, but there’s even a single pixel on my first… nothing happens. It looks fancy, sure, but KWin has an advantage here in that it *actually works*. I still think the advantage of windows wrapped around the edge is higher than it’s disadvantage (and it could be an option, why not…?). But since I am not a Kwin or OpenGL developer, I can only appreciate your amazing work on it, Martin. So, you’re trying to put KWin on your camera? Don’t see the point but good luck, anyway! I’m just kidding of course! Does it run smoothly for you ? The latest linaro ubunto build I tried run sluggishly … not ready for prime time yet! Unless you have some other trick under your sleeve ? Do you ? no, I wouldn’t say that the unity works smoothly on the system. A little off topic: can we save power like Windows 7 does? When KWin is displaying something, let’s generate 60 interrupts per second to handle 60 FPS (or more, if hardware supports more). When the screen is static, let’s generate 1 interrupt per second. When a program requests screen updating, let’s jump instantly from 1 to 60 FPS. If a program requests bogus screen updates, let’s fix it. Can you do that? Is that something that needs to be addressed at the X level?